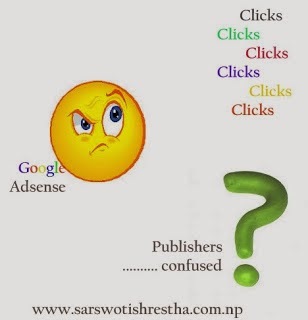 What Adsense Hates About Nepali Publishers? programe and till now there are many publishers who are using it and having nice income and there are also the publishers who dreams to have it on their websites.Since there are many publisher so Adsense team uses a very strong rules and regulations to use their service many of the publishers are removed from the programe for not following their rules and regulations and one of the great mistake most of the publishers do is they click on their own ads units to increase their revenue but all the publishers most be sure that their all clicks are monitored by strong views of Adsense team. So what happens when you click on your own ads units? Well the answer is simple that is you will be removed from the Adsense program because clicking own your own ads units is considered as fraud clicks. Google wants natural visit to its every ads units so when you click on your own ads units placed on your own websites or blogs to increase revenue then it is a kind of fraud and soon you will be thrown out from the Google Adsense family. 1.Google is a giant techno master who has some best engineers in the world that can make the technology reach the climax. So in that sense it is foolishness to cheat with Google. No one can do it. Google has developed a very unique method to identify fraud clicks. Whenever the webpage containing Adsenes ads units load on your computer the pre installed cookies get activated that record every clicks and send the Google servers the report.This unique cookies are installed on your hard drive secretly so Google is monitoring every computer of the world.So you should not click on your own Google Ads yourself. 2.The best way to make other go bad with Adsense is to click on their Adsense ads units continuously. You what happens is that when you click on others ads units continuously the Adsense mechanism considers it unusual and alerts the publishers and if the publisher don't take any action then they get banned. 3.Never be generous to your friends and click on their ads units to help them have some extra income it's all rubbish and your generosity will penalize your friend.Unless you are attracted by the advertisement do not click on ads units. Never use ads units intentionally to have extra income. It is fraud. 4.The flood of clicks are always disliked by Google Adsense and it considers it as suspicious and monitors it always. so never try to have sense to earn more by clicking on own ads units. 5. You can click on Ads units that attracts you and you feel something interesting in it that will be much natural and Google also welcomes that clicks and gives you the chance to earn online. So these were some points on why you should not click on Google Ads units yourself.I hope you get some idea and also the reasons why you get penalize every time.